Looks like I was late for the party (yet again). Anyway Panerai has released another Special Edition watch for the Asian (Chinese) market. This time it is the PAM00367. 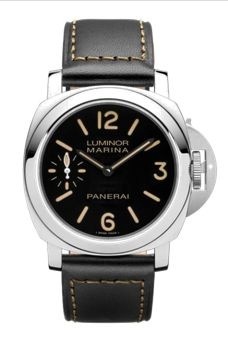 The Panerai PAM00367 is the same as the earlier released PAM00366 (Fu) model, with the difference being the 'Fu' at the 6 o'clock position has been replaced with the Arabic hour marker. It has the same 'faux patina' like the PAM00366 or like all the boutique edition watches minus the 'pig' on the dial. The watch is a special edition run of only 500 pieces and will feature a painted dial. I understand the font used on the dial is pretty close to the font on the PAM0001A. The watch will be fitted with Panerai OPII movement and such will not have the display back. The watch will come in a normal box and there is no extra strap or screwdriver (as it does not feature the new quick release lug pins). It will also come with the black leather strap with the 'orange' stitching. It is retailing for about USD 4,600. That is pretty good value for a special edition watch. The watch is currently available (if not already sold out) from Panerai boutiques in Shanghai, Beijing, Macau and Hong Kong. I heard a few (very little) will be making its way to the Taiwan boutique. The expected retail price here in Taiwan is NTD 137,000.